So, I've never been conventional. Ever since I was a tot I would choose to go a different route. Sometimes I have my reasons, other times I just want to see what will happen. This time though, I had my reasons. After breaking up with my long term boyfriend, I took over our flat. Part for necessity and partially to show myself I could do it alone. In December it was coming to the renewal of my tenancy and I began questioning things (as I do). My boiler was broken, the flat was freezing cold. I never liked it from the day I moved in as it was more my exes decision to move there than mine and most of all, it was too expensive to not be perfect. I questioned why on earth I was throwing away this much money on rent and utilities every month?! Yes okay, it's the way it works right? It's the 'done' thing. I got to thinking, what if there is another way? I got to researching. Now, as useful as the internet is, if someone has found a secret way to get rich quick or not pay rent, they don't seem to be too forthcoming with the information. So it took some digging. Eventually I came across Vanlife. Vanlife is a way of living which is out of the ordinary in a huge way. It is as it sounds, living in a van. The definition of a van is a loose one. Some live in converted transits while others use horseboxes, old buses, motorhomes and caravans. Considering the largest vehicle I had driven had been a Peugeot 206 and as a single female, I didn't feel comfortable on the road all the time. I had a job to go to every day and I felt like I needed a base. So I bought a caravan. A 1996 Sterling Europa 4 Berth. I called her Esmeralda. Before having Esmeralda, I'd stayed in a caravan once, in Devon and it sucked. I'd never set one up. It was going to be a few months of trial and error. My lovely mum, who I owe quite a bit to at this point let me have the caravan in an unused bit of garden and I was lucky enough that the guy selling it delivered it for me. So the day came and there I was, my 16ft home discreetly wedged between the hedge and the shed. Welcome home. I was lucky enough that Esmeralda wasn't in a state when I got her. 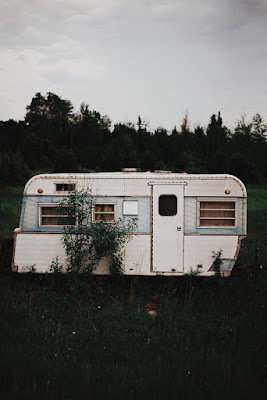 She was clean but caravan decor doesn't seem to follow any interior design rules or trends and I am not about that aesthetic. So in the week or so between Christmas and going back to work I had to move out of my flat and restore this relic to a home. Wow. If it wasn't for all the help I would never have got it done, but sure enough on the first day of the year I slept in my caravan for the first time. My flat was gone and there was no going back. In that short space of time we managed to get heating, full electrics hooked up, running water. As well as repainting the entire interior (yes, you can paint inside caravans! ), I reupholstered the two couches and bed, recovered the surfaces and made it my home. My monthly outgoings for living are now just over 100 pounds. I am happy, warm, safe and cosy. It is not for everyone in any sense. There are massive learning curves, struggles and annoyances which some people might not see worth the saving but I do. By living here I can save for a mortgage, it's a compromise for a massive pay out in the end. So if you're stuck, facing homelessness, skint, bored, fancy a change, consider it.